Endorse your product, service or brand with video content to increase your customer engagement and sales. Display one or multiple videos on a customizable mobile-friendly page where visitors can view them instantly. Add videos anytime, describe your promotion and include a button to get to your website or contact form. From the page, link to your YouTube channel along with other social media platforms. Advertise via print or online using a personalized QR Code and short URL. When I introduced my Video QR Code to the office, we were amazed in no time. Customization let us capture our corporate look, as if we developed the page by ourselves. Everything you need to know from how to create it to advertising your QR Code and short URL. Custom designed Frames can help your QR Code stand out and get even more scans. Need some inspiration? Check out these clever ways to advertise your Video QR Code. If your marketing efforts rely heavily on video content, or you are thinking about exploring what video advertising has to offer, it's definitely worth exploring how to integrate a Video QR Code or two into your material. Whether you include them as part of your product packaging or on the printed promotional material you create, these codes are a great way to link customers to video content. When you establish that link, it's much easier to motivate customers to buy, and return to buy again. Here are some reasons why. First of all, remember that a huge proportion of your potential customers have a smartphone in their pocket. And they use this phone as a key part of the way they research and purchase products. Widespread smartphone use has radically changed the way people behave in bricks and mortar stores. Now, when they see a coffee maker or a designer outfit, they have a way to instantly find out more about it. So they fire up the web on their phone and start comparing prices or calling up product descriptions. The thing is, they might not visit your content, even if they are thinking about buying one of your products. The challenge is to direct them to content that you've created, and a video QR code is a great way to do this. When places on product packaging, advertising or labels, these codes instantly direct customers to custom-made videos relating to their interests - like a highway straight to your curated marketing material. The value of these codes doesn't end in the store. Retaining customers and fostering brand loyalty is a never-ending challenge for companies, whether they make juicers or video games. Providing customer support is a crucial aspect of this challenge, but it's not always easy to connect customers with the right material. Used properly, a QR Code video player could be the solution. For example, say you're selling furniture with complex user manuals. Instead of leaving customers to wrestle with nails, frames, and power tools, your user manuals could include a code. That code could link straight to a QR Code video player featuring a step by step assembly tutorial. Adding QR Codes to user manuals is a great way to direct customers to content that promotes your brand. If that content is well-made, it will encourage customers to make repeat purchases. And it's not expensive at all. In fact, the money you save using these codes can be funneled into content creation, enhancing the power of your messages. There's a third way that adding a Video QR Code to your arsenal can enhance your marketing efforts: using a YouTube video QR Code in advertising content. Printed advertising remains a vital promotional tool. From sending out letters to people who are interested in a course, to creating adverts in food magazines featuring recipes, or simply pasting posters for music events, print media still matters. It's very simple to direct people from this printed material to promotional videos via a YouTube video QR code. Just add it in a prominent place and make it clear that users will benefit from scanning. It could link to content showing how your recipes are followed, with links to ways to purchase the ingredients. Or it could link to performances by bands performing at your event. The possibilities are endless. Finally, combining these handy little codes with high-quality video content is a great way to boost traffic to your company website or other marketing channels. When people scan the code and watch the video, you can add short descriptions detailing who you are, and how the content fits into your company profile. More importantly, you can also add buttons that will take customers straight to your home page or ways to make contact with your team. Links to your social media accounts can be included, along with buttons allowing users to share the content instantly, amplifying its impact. Whether you want to add it to product packaging, user manuals, or promotional ads, deploying a YouTube video QR Code is within everyone's grasp. 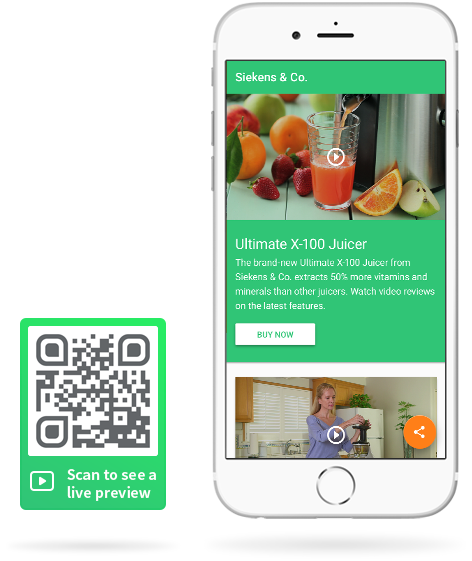 At QR Code Generator, we've created an easy to use app which allows users to create video pages and QR Codes that are tailored to specific marketing campaigns. All you need to do is provide the video content, an idea of how the page should look, and a little imagination. We'll take care of the rest. We help you run QR Code marketing campaigns successfully with custom QR Codes, scan statistics and mobile adapted content.